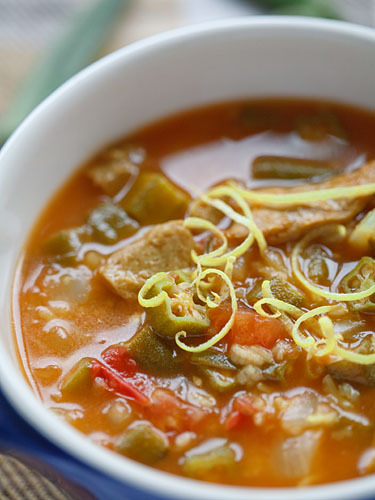 Posted in Africa, Stews and soups on June 29th, 2015 by Maija Haavisto — Be the first to comment! Sierra Leone is a country in West Africa, unfortunately perhaps best known for the recent Ebola epidemic, which has basically ended in Liberia and Guinea, but still affects Sierra Leone. It has also broken havoc on the country’s infrastructure, which was already devastated by the Sierra Leone civil war (1992-2001). Diamonds and minerals form the majority of Sierra Leone’s exports, but 2/3 of the people are subsistence farmers. The country used to be a colony of the United Kingdom and English is still the major language, though Islam is the most common religion. Officially Sierra Leone is a secular country and is thought to be one of the most religiously tolerant countries in the world. Polygamy is widespread with over 1/3 of women in polygamous marriages. Football is very popular. Rice is the staple starch in Sierra Leone, eaten at almost every meal. Groundnut stew has been called the national dish. Traditionally men and women eat separately and everyone eats with their hands from a communal dish. Various greens are popular, including cassava leaves, potato leaves and krain krain (molokhia/jute leaves). Palm oil is used for frying. Cassava root is made into bread and eaten in soups. Plantains, okra and tomatoes are used in many dishes. Sierra Leoneans also enjoy fufu (mash that can be made with different starches) and jollof rice, like in many other African countries. Several different spices are used, as well as Maggi cubes. Poyo is palm wine. Ginger beer is a popular non-alcoholic drink. Desserts often feature sesame seed or coconut. If using seitan or seitan-based mock chicken, squeeze it in your hands to remove any extra liquid, letting it absorb more flavours. Saute the onion in a little oil. Add the seitan and all the other ingredients. Cook until the rice is tender. Serve over additional rice. Makes 3-4 portions. Posted in Desserts and sweets, Drinks on May 26th, 2015 by Maija Haavisto — Be the first to comment! Jamaica is an island country on the Caribbean sea, a former colony of Spain and the UK and still a part of the British Commonwealth. It is perhaps best known for reggae, rastafarianism and Bob Marley, plus Jamaican rum. Several other music genres also originated in Jamaica, such as dub, dancehall and ska. Many kinds of sports are very popular in Jamaica, as well. Almost half of Jamaicans live outside of Jamaica due to large emigration. Only a small minority of Jamaicans are rastafaris. Jamaica has been called “the most homophobic country on Earth” due to violence against LGBTI people. Jamaican food tends to be quite spicy and especially distinct is the spice blend called jerk spice. Another essential part is ackee fruit, related to lychee. Raw ackee and inedible parts of the fruit are toxic, however, and have caused many deaths. The flavour has been compared to cheese or eggs(!). Many other fruit are also enjoyed. Salted fish and rice and beans are also very popular. 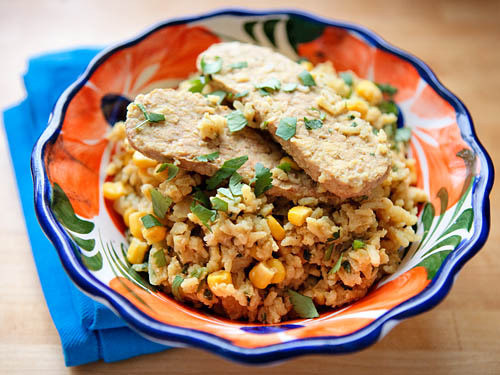 In general, rice, beans and plantains are used in many dishes, like elsewhere on the Caribbean. Jamaican patty is a savory pastry similar to empanadas. Common spices include allspice, thyme, annatto, black pepper, garlic, ginger and Scotch bonnet pepper, a fiery chili. For sweet drinks vanilla and nutmeg are common seasonings. Rastafaris are usually completely or mostly vegetarian and follow “Ital” lifestyle, which means eating pure natural foods, though its definition varies. Some don’t even eat salt. Guanabana and the related cherimoya (annona) are among my favorite fruits. Cherimoya is sweeter and creamier, while guanabana is more tart, but not exactly sour as the other name soursop suggests. It is also known as graviola. The taste has been compared to pineapple, guava, strawberry and mango and I also think it has some similarity to orange. 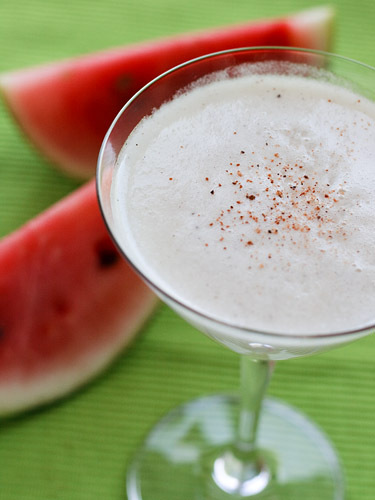 So even though I’ve recently made much more drinks for Vegventures, I had to make this drink. And it was heavenly! You can use whatever sweetener (not too strongly flavoured), I suffer from severe hypoglycemia so I used my trusty combination of erythritol and stevia. Fresh soursop may be hard to find, but frozen stuff, which I used, is usually easy to source in Asian stores, the one I’ve brought in Finland and here is sold in a white plastic jar the size and shape of a soft drink can. Note that it’s not pureed smooth, you’ll probably want to blend it and strain out the fibers. If you can’t even find the frozen fruit, diluted and sweetened guanabana/soursop nectar should be fairly easy to find wherever exotic juices like mango and lychee are sold. E.g. the Maaza brand is very common and Asian stores have the juice in cans. In that case don’t add any water. However, I find the frozen stuff made for a much better juice. Blend the fruit and water together. Strain if needed. Add all the other ingredients. Serve cold. 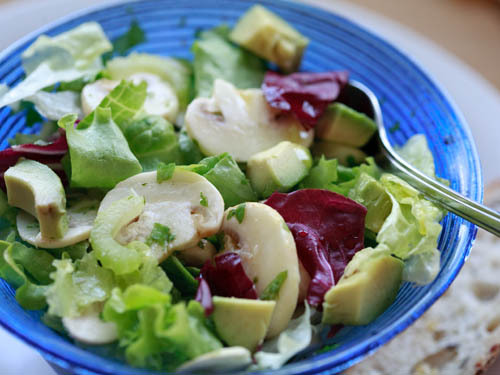 Posted in Europe, Salads on April 29th, 2015 by Maija Haavisto — Be the first to comment! 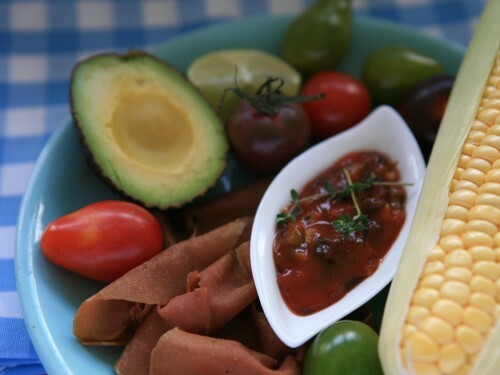 Posted in Africa, Other main dishes on March 31st, 2015 by Maija Haavisto — Be the first to comment! Comoros is a tiny island nation on the African coast near Madagascar. It consists of four main islands and many smaller ones. One of them, Mayotte, remains an overseas department of France. The rest gained independence from France in 1975, though sadly there have been several coups after that. There are less than a million inhabitants, but the population density is very high, and the country is very poor. Comoros adopted Islam early, supposedly soon after Muhammad’s death. Spices are the main export, especially vanilla. It is also the world’s largest producer of ylang ylang, a sensual essential oil. The Comorian cuisine has been influenced by many visitors and colonial powers, including Portugal, France, Madagascar, Arabs, India and Indonesia. Rice forms the basis of the diet, usually served with meat (usually goat) or fish. Some other starches like cassava, sago palm and plantains are also used. Both coconut milk and dairy are used. Spices are used a lot, such as coriander, cinnamon, ginger, cloves, nutmeg, cardamom, saffron and vanilla, which is also used for seafood and other savory dishes. Thyme and parsley probably originate from France. Various fruits are consumed, especially jackfruit, pineapple, mango, avocado and banana. Carbs (especially starch) are very bad for my body, but eating them becomes quite inevitable when making Vegventures. This recipe seemed interesting because of the amount of spices, including a little bit of coffee. Plus the thickening with mashed potatoes. It’s pretty good, though coriander/cilantro is the main taste. Fresh coriander goes really nicely with corn. The coffee you can’t really taste, I guess it just adds some depth. I wasn’t sure whether the tempeh should be mashed or not, so I left it intact. You could also use commercial mock fish. Tip: if you’re not a coffee drinker, like I am not, if you are in a hotel take some of those coffee single serving packs with you. They’re quite convenient when cooking something/baking that requires a little coffee. Slice the tempeh thinly and steam for 10 minutes. Fry in oil until slightly browned. Add the garlic, mashed potatoes and shallots and fry for 5 minutes. Add the spices and 3 dl/1.25 cup water. Mix and continue simmering gently. Add the cooked rice and sweetcorn and stir vigourously for 2 minutes. Add the coriander and stir in. Allow to simmer for 10 minutes. Serve hot. Posted in Protein main dishes, Salads on February 18th, 2015 by Maija Haavisto — Be the first to comment! Indonesia is a geographically small country in Southeast Asia consisting of almost 18,000 islands, several of which only partially belong to it. Yet it has over 250 million inhabitants (nearly as many as in the U.S.!) belonging to over 300 ethnicities, with over 700 different languages, which is quite special. At least one country where the national motto makes a lot of sense. “Bhinneka Tunggal Ika” means “Unity in diversity”. While there has been conflicts, I think the country is surprisingly stable considering the diversity. It is a Muslim-majority country, but officially a secular one, though there is administrative district ruled by Sharia law. Until the end of second world war, Indonesia was a colony of the Netherlands, which remains very visible in both countries. E.g. Indonesian food is hugely popular here and considered ordinary everyday food. The Sumatran orangutan lives on the Indonesian island of Sumatra. Batik and other textiles have been culturally important, while badminton and football are the most important sports, with the country particularly exceling in the former. Of course Indonesian cuisine reflects the diversity, as well, though it is still surprisingly recognisable as a whole, mostly due to the plentiful use of spices and some ingredients. Tempeh, a fermented soy product and probably the healthiest way to eat soy besides natto (miso is hardly a “food”) was invented in Indonesia and remains very popular, in no way exclusive to vegetarian dishes. The same goes for tofu. Oncom is a fermented product somewhat similar to tempeh. Most meat-free dishes feature fish sauce, shrimp paste and/or boiled eggs. Typical ingredients, some of which do not commonly feature in Indonesian restaurants abroad, include e.g. kangkong (water spinach), sweet potato, corn, eggplant, cucumber, bitter melon, chayote, calabash, drumsticks, luffa and yard-long beans, though there is a huge variety of vegetables used. Spices are often ground into spice pastes or bumbu. They include e.g. clove, nutmeg, ginger, galangal, chili, coriander, Indonesian bay leaf, turmeric, lemongrass, pandan, cinnamon and candlenut. Bumbus are so complex it’s often difficult to discern individual spices. Coconut, peanut, palm sugar, shallots, lime juice and tamarind also add important flavour. Kejap manis is a sweet soy sauce with palm sugar. The most famous Indonesian dishes are probably nasi goreng (fried rice) and satay (meat skewers with peanut sauce). Several dishes, sides and condiments are usually served at once, culminating in the rijsttafel feast, which is a table full of dishes. Foods are usually served with rice, sambal (chili sauce) and krupuk (prawn crackers), often also pickles and things to sprinkle over, like spiced coconut. There are many types of cakes and pastries. Fruit and fruit juices are very important. There are many sweet, thick, iced, often soup-like drinks that are served like desserts. Fruit may also be served as fruit chips. 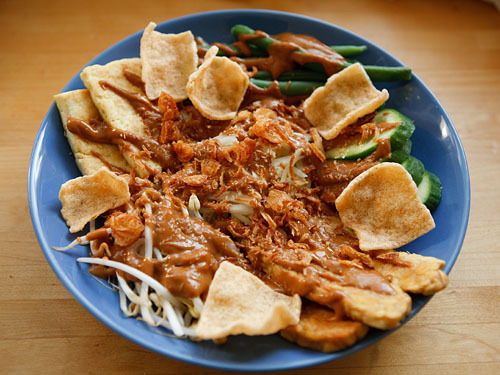 Gado gado is one of my favorite dishes and there are varying ideas of what goes into it. Some list potatoes as mandatory while others as optional or do not include them at all (I’ve never seen gado gado with potatoes in the Netherlands). Usually it seems to feature cucumber, bean sprouts, green beans, and cabbage, sometimes carrot. Some recipes include e.g. tomatoes, spinach, water spinach, jackfruit, bitter melon, chayote and/or corn. Eggs, fried tempeh and fried tofu are almost always included. I’ve had gado gado that included cubes of rice. Which vegetables you include is probably not so important. Broccoli, cauliflower, asparagus and such would also work nicely. There is also wide variation in how the peanut sauce is flavored, depending on the island of origin, but all recipes seem to use palm sugar and most have tamarind, though the amount varies. Kejap manis (sweet soy sauce) and lime juice are also common. Others feature coconut milk, sambal oelek, garlic, galangal and/or lime leaves. Most recipes have shrimp paste or fish sauce, too, so I used a little marmite. Gado gado is usually topped with fried shallots, emping crackers and shrimp crackers, but I don’t like emping. Luckily there are other types of vegan crackers available. If you can’t find fried shallot (they seem surprisingly hard to find here, finally found them outside of Chinatown), use packaged fried onion. I based my recipe mostly on Maangchi‘s but also looked at some others, both from blogs and cookbooks. If you want truly authentic gado gado, you should use roasted peanuts and grind them yourself, but natural (sugar-free) peanut butter is not a bad base. Soak the tamarind paste in the 1/4 cup boiling water for about 1 hour. If using lime leaves, also add them here. Strain. Add the liquid and the hot water and all the other ingredients to the peanut butter. Mix until emulsified. Add more water or spices as needed. If you’re going to serve the sauce cooler, remember that it will thicken, but you can always add more water later. Once the peanut butter is diluted, even cold water works well. Prepare the vegetables, e.g. slice and remove the tails from the beans. Blanch or quickly steam the vegetables, except for cucumber. For the beans you might want to use five minutes, but for cabbage and sprouts only 1-2 minutes. Also steam the tempeh for about 10 minutes to reduce the inherent taste. Cut the tofu and tempeh into fairly thin slices. Fry the tofu and tempeh in plentiful oil until browned and crisp on the sides. Drain on kitchen towels to remove excess fat. You can serve the whole dish warm or at room temperature or only warm the sauce. Place all the salad ingredients on a plate. Usually it’s done in sections, not mixed. Pour some of the sauce on top and add fried shallot on top. The krupuk can be placed on top or eaten with the dish. The sauce makes about 4-5 portions. Posted in Africa, Drinks on January 28th, 2015 by Maija Haavisto — Be the first to comment! As far as African (especially West African) countries go, Ghana is doing pretty well. It was the first African country to declare independence from European colonisation. It is one of the stablest countries and largest economies in Africa and has possibly the best healthcare system on the continent. Ghana has large natural resources of three coveted goods – gold, diamonds and oil – as well as many other minerals. It is also major producer of cocoa. Traditionally clothing design has been very important in Ghana, including printed adinkra symbols and kente, a hand-woven fabric in which different colors have different meanings. Music, dance, film, literature and sports, especially football, are also important forms of culture. The Ghanaian cuisine has quite a decent amount of variation. For example, most dishes have a staple starch with a protein-containing sauce or soup, but instead of the usual 1-2 staple starches, there is a whole handful: cassava, plantain, sorghum, millet, yam, taro and (fermented) corn dough/porridge. Rice and wheat are gaining popularity, including the almost pan-African jollof rice. Beans can stand for both protein and starch. Popular vegetables include eggplant, onions, sweet potato, spinach, okra, tomato, mallow leaves and taro leaves. Many types of meat, fish and seafood are used, as well as eggs. Mushrooms, pumpkin seeds, tigernuts, peanuts and palm nuts also feature in many dishes. Palm oil is used plentifully, giving many dishes a red hue, though some foods get their redness from chili. The variety of spices is quite large, too, including ashanti pepper, ginger, garlic, bay leaf, basil, thyme and nutmeg. Street food is very popular. 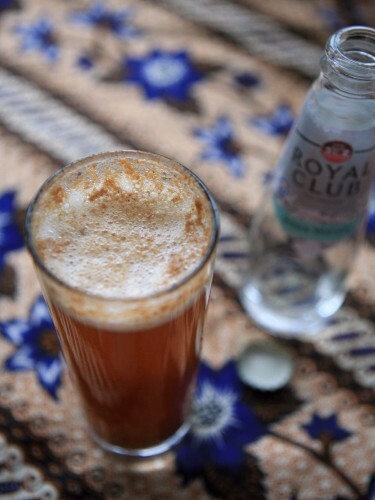 There is also a wide variety of popular Ghanaian drinks, both alcoholic and non-alcoholic. Puha is made from tamarind, for most of us probably more familiar from Indian and other Asian cooking. I chose this recipe because I wanted to use one of my new favorite spices, cubeb pepper. The original recipe has ashanti pepper, which I’ve been unable to find (heck, I even went to “Africatown” when I was in Brussels mostly for that, and still no luck), but cubeb pepper is supposed to be quite similar. I don’t know what exactly ashanti is like, but cubeb is lovely, it’s like nutmeg and black pepper married eucalyptus and the aroma really goes into your sinuses. Here, though, it’s mostly a hint, so you can substitute black pepper like the original recipe suggests, though it won’t be the same. Peculiarly, some places listed 2 tbsp of ashanti, while others hand 1/2 tsp. That’s only 12x difference… I went with 1/2 tsp, 2 tbsp might be pushing. I was surprised by how tasty this is. If you dilute it with soda water, it tastes like a pretty normal soft drink, in a good way. Almost but not quite entirely unlike certain multinational carbonated drinks. You can use erythritol, stevia and other non-sugar sweeteners, though they may affect how long the drink keeps in the fridge. Pure stevia might be pushing it, as the recipe calls for a lot of sugar (because tamarind is very tart). Toast the peppers on a dry pan until fragrant. Grind the pepper in a mortar or otherwise (e.g. with a hammer), it’s fairly easy. Bring the water to boil and stir in the sugar until dissolved. Mix in the tamarind and spices. If it’s a sticky block try to break it apart a bit. Let brew for an hour. Strain. Serve cold, diluting before use at about 1:1 (preferably with soda water), or as you prefer it. Note: Don’t use metallic bowls or containers for the tamarind, since it’s so acidic. Posted in Casseroles, Desserts and sweets, Europe, Middle East, North America, Pasta and noodles on December 22nd, 2014 by Maija Haavisto — Be the first to comment! Judaism has a country, kind of – there are slightly more Jews living outside of Israel than in there – but Israeli cuisine is not the same as Jewish cuisine. The latter of course has geographical differences and some Jewish specialties only exist in one area. Judaism is considered a religion, but it’s also heavily an ancestry/ethnicity/culture (and many people consider themselves atheist or secular Jews). Hence this entry. There used to be about 17 million Jews before WWII, but 6 million were killed in the holocaust. Almost half of the remaining ones live in the U.S. There are both ethnic and religious differences inside the Jewish population, the main ethnic groups being Ashkenazi and Sephardic Jews. These are different from the different religious movements, such as Orthodox Jews. There is also Zionism (supporting Israel); not all Jews are Zionists and not all Zionists are Jewish. The Jewish cuisine is probably best known for rich baked goods and some greasy dishes eaten on Hanukkah, like latkes, fried potato pancakes. The oil is not just for flavour, it has religious symbolism. Jewish cuisine is limited by kashrut (purity) rules. Pork is unclean, but so are several other food products. Some food products prepared by non-foods can also be considered unclean.. There are some additional rules on Passover. This has resulted in some well-known specialty foods, like the unleavened matzo bread, also used as a substitute for pasta and grains in some dishes. Most vegan ingredients are kosher, but not all. Apparently some tofu, for example, may not be. For more information on kosher in general, check Wikipedia. 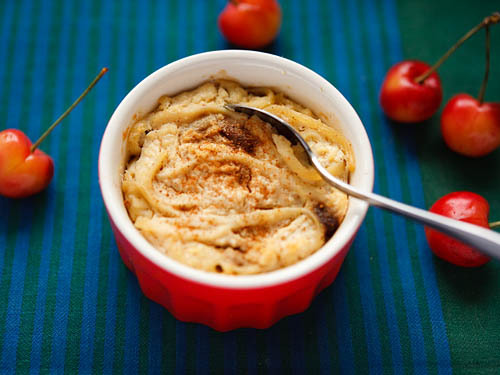 Kugel is usually a sweet, bland noodle casserole, though it may be also made with matzo, potatoes and some other things instead of pasta. Savory versions exist, as well. Sweet kugel is a traditional Hanukkah food. The raisins, cinnamon and curd cheese apparently originate from Poland. Some people also vary the seasonings, e.g. using fruit or dried fruit in it. This much-praised American-style recipe comes from Food Network. It can, of course, be made gluten-free by using gluten-free noodles. Low-carb noodles should work too, as long as they aren’t too slimy or otherwise weird. The cherries in the photo are Rainier cherries, so they’re supposed to be partially yellow. Preheat the oven to 375F/190C. Cook the noodles according to the package directions. Mash the tofu by squishing with your hands (not with a blender) until it resembles cottage cheese. Mix together all the ingredients except for noodles. Add the noodles and mix. Pour into a greased baking dish or individual ramekins (6-10 ramekins, depending on their size). Bake until set and slightly golden at the top. For my ramekins it took some 35 minutes, but for a large dish it could take an hour. Serve hot, warm, at room temperature or cold. Posted in Desserts and sweets, Europe on November 25th, 2014 by Maija Haavisto — Be the first to comment! Estonia is a country in the Baltic region of Northern Europe. It only has a population of some 1.3 million people, one of the lowest in EU. Estonia was occupied by the Soviet Union from World War II until the fall of the Soviet Union, but nowadays is very much a Western country with a high economic and technological development. Most people speak Estonian, which is quite closely related to Finnish (with significant German influences), though almost 1/3 speak Russian. Only 16% of Estonians believe in God, a very low figure compared to most countries. Over half of the country is covered by forests. Estonia has a long coastline considering the size of the country and the islands, beaches and spas are among the most popular tourist attractions. Sports, literature and music are important parts of the culture. I have some personal experience of Estonian cuisine, as my best friend in elementary school was Estonian and my family even spent time at their house in Estonia. Sadly I can’t remember much about it any more, except the plentiful use of quark/curd and many other fermented dairy products. She or someone in her family also put strawberry jam in tea, but I think that’s more of a Russian custom. The Estonian cuisine is quite Slavic, with influences from Finland and Sweden. Rye bread, potatoes and pork form its core. Fish, especially Baltic herring, has also been very important. Many dishes are served cold, such as rosolje, a beet salad with potatoes and herring – a similar dish is eaten in Finland as rosolli. Soups are popular and often feature (fermented) dairy. There is also a dessert soup made with rye bread and apples. Cabbage, wild berries and mushrooms are enjoyed when in season and preserved for the winter. Roosamanna (isn’t that a beautiful name? ), also known as mannavaht, literally means pink semolina/cream of wheat. In Finland it’s called whipped porridge and most commonly made with lingonberries instead of cranberries (though they are very similar) and without the cinnamon stick (which does add a nice touch). 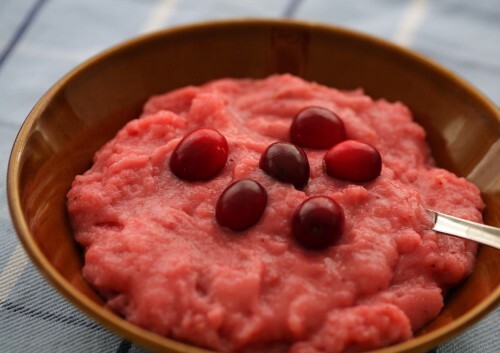 The recipe says you can use store-bought cranberry juice, but in my experience for the porridge to whip into a fluffy pudding you need pectin, and pectin is present in pureed berries, but scarcely in juice. While not as traditional, you can also try this with fruit, e.g. plums or rhubarb. For best results you should whip it just before it starts to really solidify, many recipes instruct to place the pot in a bath of cold water, but I haven’t found that necessary. There are quite different amounts of semolina used in different recipes, this uses less than most Finnish recipes so I used a bit more. May depend on the type of semolina, too. Finnish recipe sites suggest the recipe can be made gluten-free by using either coarse rice flour (and stirring vigorously when adding it) or polenta, but I haven’t tried it. You can also easily make this sugar-free by using stevia or erythritol. Boil the berries until they split. Press the mass through a sieve. Add water (if needed) to juice to make 2 cups of liquid. Add sugar and cinnamon. Bring to a boil adding wheat farina gradually and beating constantly. Boil for 1-10 minutes, until done (depending on the type of farina you’re using) and let cool. Remove cinnamon stick. Beat (preferably with an electronic mixer) the slightly warm mixture until pink in colour and somewhat fluffy in texture. Pour into individual dessert dishes. Serve cool, as is or with soy milk. Posted in Caribbean, Dips, sauces and condiments on October 18th, 2014 by Maija Haavisto — Be the first to comment! Saint Barthélemy or St. Bart(h)s for short is a small island nation on the Caribbean. “Discovered” by Columbus, for a short time St. Barts was a colony of Sweden, but this only shows in a few places, like the country’s coat of arms and the name of the capital city (Gustavia) and its airport (Gustaf III airport). It still belongs to France as an “overseas collectivity”, uses French as the official language and the culture has heavy French influence. The population is less than 10,000. Nowadays the island is mostly known as a luxury holiday destination, especially in the winter. Rugby and watersports are popular. Both French and Creole cuisine are popular on St. Barts, often with West Indian influences. Seafood is of course eaten a lot. Because of the wealthy tourist population, the island is full of fine dining restaurants serving different cuisines. There are also gourmet festivals. It is hard to find information on what kind of dishes the locals eat. The land is arid, so pretty much all food has to be imported. This condiment of unknown authenticity is based on ketchup. One would think that adding vinegar and lime juice to ketchup makes for a very tart sauce, not so. Ketchup is full of sugar and when it’s heated, some of the acetic acid evaporates. So the result is actually quite sweet. Here it’s served with store-bought seitan carpaccio (which is pretty good) and a variety of foods I just happened to have (including baby avocado and some really nice heirloom cherry tomatoes) which seemed to fit the theme, aka “white girl’s idea of Caribbean food”. Heat the oil/margarine in a frying pan. Add onion, spring onion, garlic, parsley and thyme and cook over medium heat until soft, about 3 minutes. Add all the other ingredients. Bring sauce to a boil, then reduce the heat and simmer for 3 minutes. Add more hot sauce, lime juice, or salt to taste. Let cool and serve as a condiment. Makes about 1 cup/2.4 dl. Sudan used to be the largest country in Africa and one of the largest in the world, until the southern part separated into South Sudan in 2011. There are hundreds of different ethnic groups, but most Sudanese are Muslims and speak Arabic. English is the second official language. With the names Nubia and Ethiopia (which nowadays is a different country) Sudan has a rich history of ancient civilizations, spanning over 10,000 years, most of which resided along the river Nile. Since its own independence in it 1956 it has gone through two civil wars and the Darfur war. Sudan suffers from many problems, from human rights violations and hunger to desertification (most of the country is already desert). While the economy is growing, the oil reserves haven’t been able to abate poverty. Football and various kinds of traditional music are important parts of the culture. Because of the huge ethnic diversity, the Sudanese cuisine is also very diverse. It has got significant influences from Middle East. Stews served with porridge or bread form the traditional meal, especially a bread called kissra made from durra or corn. For porridge sorghum and millet are also used. Stews often contain offal, fish potatoes, eggplant, onion, greems. tomatoes and okra, sometimes dairy as well. They may be flavoured with cinnamon and cardamom, sometimes dates or peanut butter. Alcohol is banned by law, but illegal alcoholic drinks are brewed from e.g. dates. Some non-alcoholic drinks are made from fruit, others from corn flour. Coffee and hibiscus tea are very popular. Coffee is often spiced and sweetened with plenty of sugar. This was a bit of a peculiar recipe (I don’t know how authentic): tomatoes in tomato sauce with fresh tomatoes. They are, however, stuffed with something other than tomatoes. In Europe when tomatoes are stuffed usually a slice is removed from the top and the innards scooped out. Here, however, a deep cross is cut into the tomato before scooping. They were a bit hard to fill without spilling the stuffing, and somewhat difficult to fry, as well. Plus they hardly even look like stuffed tomatoes in the photo. I used kumatoes (tomatoes that are green when ripe), hoping for a nice contrast in the photo, but you can barely see it. The dish was okay, it tastes like you’d expect – tomatoes, dill and cinnamon. The cinnamon makes for a very nice smell when baking it. The original recipe didn’t have cooking times or temperatures, so I had to make them up. Preheat the oven to 390F/200C. Mix the rice, mock minced meat, salt, pepper, 1 tsp garlic powder and dill together. Slit the tomatoes halfway across the centre (to create a fairly deep cross in the stem end). Squeeze the tomatoes to open the slits and scoop out the flesh with a spoon. Heat the oil in a large frying pan and fry the tomatoes in the fat, rolling them constantly until they become dark red on all sides. Remove the tomatoes along with the oil and place in a casserole dish. Combine the tomato paste and water along with the salt, cinnamon and the other 1 tsp garlic powder. Stuff the tomatoes with the rice mixture and cover with the tomato sauce. Bake in the oven for 30 minutes. 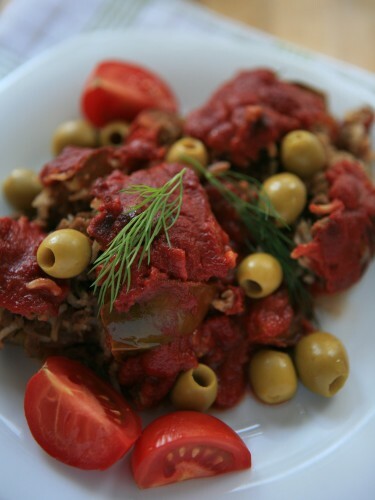 Serve hot, surrounded with sliced raw tomatoes and top each slice with green olives. Makes four portions.